The Coveo administrator can configure where each facet or Related Results panel appears in the Coveo .NET Front-End search interface. In a .NET search interface, facets and Related Results panels can appear vertically stacked on either sides, or at the top of search results. Example: In the following example, a few facets appear in the left zone, one appears in the Dropdown format in the top zone, and one Related Results panel appears in the right zone. You can manage the position of the facets and Related Results panels globally for a .NET search hub. 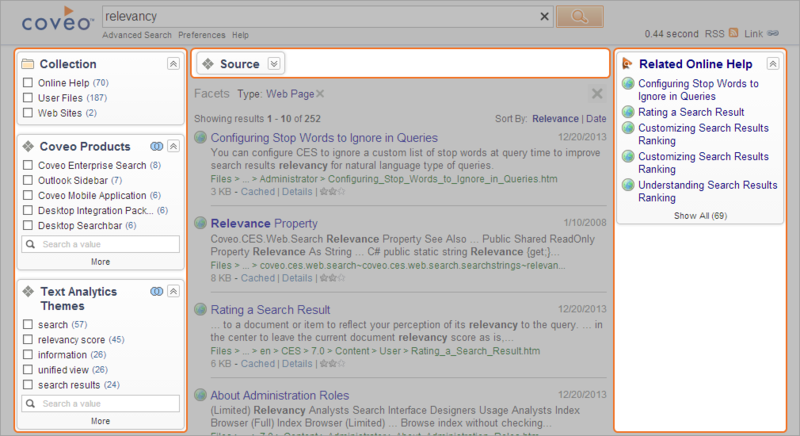 Each search interface of the hub can inherit or overwrite the hub default facet Related Results panel position. Similarly, each facet and Related Results panel in a .NET search interface can inherit or overwrite the default search interface facet and Related Results panel position. You can configure facets and Related Results panels to also appear in the top horizontal zone but only at the facet level. Select the Search Hubs tab. On the menu bar, in the Current Hub drop-down list, select the hub for which you want to configure the default facet position. In the navigation panel on the left, select General. In the Default Facet Position drop-down list, select the desired default zone (Right, Top or Left) where facets will appear by default for the search interfaces of this hub. Similarly, in the Default Related Results Position drop-down list, select the desired default zone (Right, Top or Left) where Related Results panels will appear by default for the search interfaces of this hub. On the menu bar, in the Current Interface drop-down list, select the search interface for which you want to configure the default positions. On the menu, select Features. In the navigation panel on the left, select Facets and Related Results. In the Default Facet Position drop-down list, select the desired zone where facets will appear by default in this search interface. Choose Hub default facet position when you want to use the facet position configuration set at the hub level. This option is useful to easily and globally change the position of facets from the hub level. Choose Right, Top or Left when you want to customize the default facet position for this search interface. Similarly, in the Default Related Results Position drop-down list, select the desired zone where Related Results panels will appear by default in this search interface. On the menu bar, in the Current Interface drop-down list, select the search interface containing the facet or Related Results panel for which you want to configure the position. In the panel on the right, under Facets and Related Results, click the facet or Related Results panel for which you want to customize the position. In the Zone drop-down list, select the desired facet zone where you want this facet or Related Results panel to appear. Choose Interface's default facet/related results position when you want to easily and globally change the position from the search interface level. Choose Right,or Left when you want to only customize the position of this facet or Related Results panel. Choose Top to make the facet appear at the top of search results. Note: While the search interface is loaded in a browser, a Related Results panel can disappear or keep its old settings when you make customization in the Interface Editor, even after refreshing the page. These issues may occur because the state of the Related Results panels is saved in the page URL hash. Restart your browser or, in the address bar, delete the URL segment starting with the # character.